Oh man, these are SOOOOO freaking good. And I will note that I stole borrowed this amazing recipe from my brother and sister-in-law. It is SO GOOD. And, you know how I feel about onions 'round these parts, and I am excited to tell you that this recipe does not include ANY of them (WOOT!) so it is most definitely Alex-approved. It is ridiculously easy to prep and make, you need maybe 45 minutes all around including bake time! Super easy! Take the rolls out of the packaging and use the bread knife to slice them (altogether!) in half so you have a bottom half of rolls (still not separated!) and a top half. Once your butter is melted, mix in the packet of Italian seasoning. 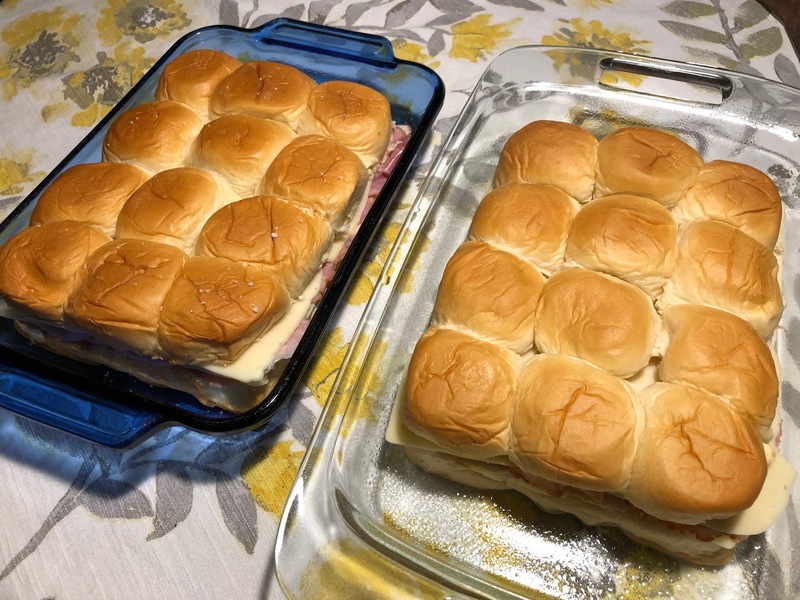 Remove from the oven, slice the sliders so there are 12 individual ones in each pan, dig in, and enjoy!! So freaking easy and so freaking delicious! Yes, you could add dijon or honey mustard and/or mayo inside the slider if you want some more flavor, but I don't like those things so my recipe does not include them :) If you make these, let me know what you think! !